29½ in. (75 cm.) high; 45¼ in. (115 cm.) diam. Mr. and Mrs. Luke Dillon-Mahon, Clonbrock, sold Christie's house sale, 1 November 1976, lot 113 (illustrated). 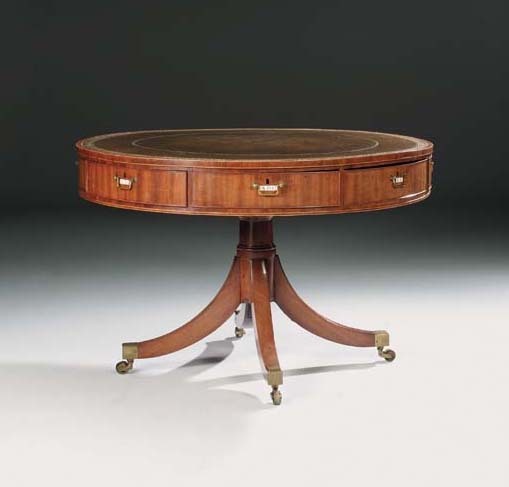 This library drum table was made by Gillows, the celebrated London and Lancaster firm, for Luke Dillon, 2nd Lord Clonbrock, to furnish his new library at his ancestral home, Clonbrock in Co. Galway. Gillows' bill, dated June 1801, still survives and the furniture which arrived in twenty-six large packing-cases, cost the considerable sum of £1,054 0s 3d. This library table is undoubtedly the 'neat Circular Mahy. Table with black leather &c - £13.15.0' listed among other items including 'a large and handsome Mahogany Bookcase with 6 Doors above & 6 Doors below'. The Gillows archive, now in the City of Westminster Library, has a sketch for wings to enlarge this bookcase in 1817 to house Lord Clonbrock's ever-growing collection of books purchased in London and Dublin (no. 2057). Lettered tablets and rectangular drop-handles also appear on a closely related drum table made for George Smith Esq. in September 1795, the drawing for which appears in the Estimate Sketch Book (no. 33,297, illustrated in L. Boynton, (ed. ), Gillow Furniture Designs 1760-1800, Royston, 1995, p. 163, fig. 27).